My upcoming trip to Djibouti may create an image of me as a brave, intrepid adventurer. In reality, I’m a former journalist who has used the changing media landscape to explore what I’d really like to do with my life. I have a really practical part-time job working for a great corporation with some of the most interesting and genuine people I have ever met. This has allowed me to return to school and earn a second bachelor’s degree, do a virtual internship with USAID, spend more time with my daughter and serve on boards in the community. And travel. So, Monday should have been the day that I prepared my visa application materials for transit to D.C. but a funny thing happened at work. I broke my right hand and yes, I’m right hand dominant. Less than four weeks out from my exotic dream voyage and I broke my hand. Specifically, I sustained a [rather fortunate under the circumstances] spiral shaft fracture of my fifth metacarpal. Sparing the exciting details of my first 24 hours with a broken bone, most of which were spent waiting for an ortho appointment, let’s say that my package got out today and I have a nice red cast. I have mentioned my upcoming out-of-country travel to my medical team. 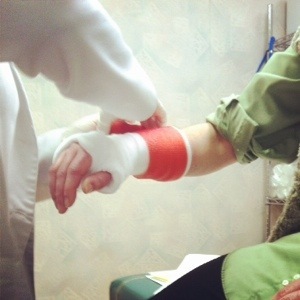 On April 15, they will remove my cast and place me in a removable splint of some kind based on the rate of healing. My traveling companion has expressed his relief. When my hand heals more, I shall devote a blog entry to “life imitates art” and how my fiction tends to draw weird coincidences into my life. I think my imaginary friends and I share karma. When Basilie got pregnant, I got pregnant a few months later. She had a stroke a few months ago, and she lost the use of her right hand. From here on out, only goodness for Basilie. I’d share some of the stuff I’ve already written about Basilie, but I am very clumsy with my left hand only on the keyboard. It has taken forever to type this. Remember all that time I dedicated to finding a journal for my trip? I used Facebook to poll my friends about the final three candidates and now… here’s hoping I can write in it when I travel. Let me leave you will this… My daughter has been obsessed with broken bones since she saw the episode of the Waltons where Elizabeth fell off the wood pile and broke her legs. Needless to say, this process has fascinated her and the medical staff has allowed her to come with me for most of my treatment. I’ll share a photo she took while I got my cast.